James O. Ament, 89, of Lititz, passed away on February 17, 2018 at his home. He was the loving husband of Helen Mae (Fyock) Ament. Born in Lancaster, PA., he was the son of the late Harry C. and Miriam (Kendig) Ament. 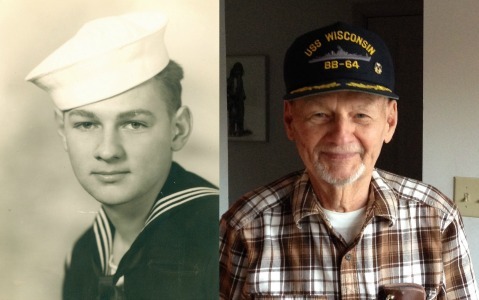 James proudly served in the U.S. Navy aboard the USS Missouri and USS Wisconsin. While on leave in Virginia Beach he met his wife to be. Jim and Helen would have celebrated 65 years of marriage on April 5, 2018. After Navy service Jim worked for the US Postal service, retiring as Postmaster of the Landisville post office. Jim was also a member of the Lamberton Lodge # 476 F. & A.M.
Jim and Helen enjoyed retirement life in Pine Island Florida. Jim was an avid fisherman and enjoyed boating, golf and long walks while in Florida. Jim and Helen served on the Pine Island board and were actively involved with transitioning the development from real estate owned to privately owned by the residents. Jim and Helen moved back to Lancaster to be closer to family and to offer support to their son and his growing business. Jim was a strong mentor to his six grandchildren. In addition to his wife Helen, he is survived by a daughter Karen L. Branner (wife of Mike) of Lancaster, PA and a son James R. Ament (husband of Pamela) of Lititz, PA. Also surviving are six grandchildren. He was predeceased by a brother, Miles K. Ament. Relatives and friends are invited to attend an informal Celebration of Life Gathering at DeBord Snyder Funeral Home & Crematory, 141 E. Orange St., Lancaster, PA 17602 on Thursday, March 1, 2018 from 6:30 to 8:00 pm. May you find comfort in the God of All Comfort. May He bless you with the riches of His grace. May His peace permeate each of your hearts in the midst of your loss and grief. A member missed is a member loved. A member loved and missed is to have the heart broken. God bless you all for loving well. I enjoyed working with both Jim and Helen when I first started at Stemgas Publishing; they were both so lovely and kind. My deepest sympathy to Jim’s family in this time of great loss. I am sorry for your loss of James. May you find comfort in the many precious memories you shared together as well as the promise of our Heavenly Father, to restore our dear loved ones to perfect life on a paradise earth. As you contemplate this promise, draw close to God in prayer and he will draw close to you, and provide you with the strength you need to carry you through the difficult days ahead. All the best wishes for your family at this time, take care. I am sorry for your loss of James. As I always called him Mr Ament to me. This is Teddy Long, Ted and Maxine Long’s son, long time friends and neighbors from New Holland Ave. God Bless.